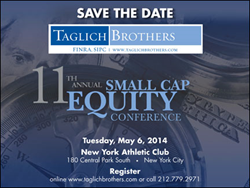 DecisionPoint Systems, Inc. is pleased to announce that Nicholas Toms, CEO and Dave Goodman, CFO of DecisionPoint Systems, Inc. (OTCQB: DPSI) will be presenting at Taglich Brothers 11th Annual Small Cap Equity Conference May 6, 2014. DecisionPoint Systems, Inc. is pleased to announce that Nicholas Toms, CEO and Dave Goodman, CFO of DecisionPoint Systems, Inc. (OTCQB: DPSI) will be presenting at Taglich Brothers 11th Annual Small Cap Equity Conference May 6, 2014. The Conference will take place at the New York Athletic Club, New York City. To request additional information or to register, contact Taglich Brothers at 212-779-2971 or visit http://www.TaglichBrothers.com. DecisionPoint Systems, Inc. improves productivity and delivers operational advantages to its clients by helping them move their business decision points closer to their customers. They accomplish this by making enterprise software applications accessible to the front-line worker anytime, anywhere. DecisionPoint utilizes all the latest wireless, mobility, and software development technologies, http://www.decisionpt.com.